A full slate of games for sports bettors today. Be alert!!! Betting is 55 on the dog(again) with the line moving from -12.5 to -14-119. Models slightly favor S Alabama. Variables slightly favor S Alabama and public betting favors Air Force. We have seen this pattern time and time again lately. And it the usual outcome a pass for me. Betting is 55% on the dog(sound familiar) with the line moving from -3-115 to -9.5-110. Maybe the line has moved because everyone thought Armstrong was going to start today but I doubt it as a torn hamstring takes longer than a few weeks. So its most likely just another beg service play but even so that is a big move even for those. My models show the game to be slightly overvalued and now point to Nebraska. Variables favor Tenn slightly and public betting favors Tenn. So like we saw in the first two games of the day nothing clear cut to wager on so a pass for me. Betting is 55% on the dog with the line moving from -3.5+102 to -2.5. Models favor N.Carolina, Variables favor N Carolina slightly public betting favors Stanford. This is a game where if the public betting were on Stanford I would be betting N.Carolina. But since that is not the situation this game is an easy pass for me and that is what I am going to do. You sure do a lot of passing on these bowl games.Do you ever make a wager? Yes occasionally:) I think so far this season I am 3-0 on my bowl picks. Things have to line up for me to wager on a game. I am long past the gamble for gambling sake. But I have to admit it was a habit not easy to break! Best of luck whichever side you take on this game. 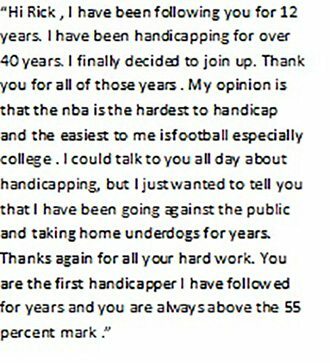 It’s going to be another busy day for handicapping so thought I would get this missive out early today. On Thursday we went 2-2 on Plays winning with St Johns +8.5 in college hoops and Detroit +140 in the NHL while losing with Mississippi +11 in college hoops and Miami +7 in the NBA. So a +.20 unit day for Thursday. 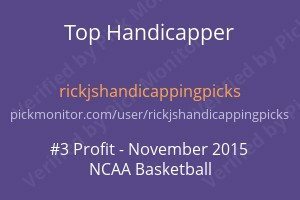 So far today I have sent out no plays but I suspect that will change as there is a full slate of games in all sports today. Betting is 64% on the dog with the line moving from Georgia -1-111 to TCU -3-108. That is quite a move where only 36% of the betting is on that side. I suspect that this is a service play put out by more than one service. That usually is that reasons for moves like this barring injuries. Models point to Georgia, Variables point to TCU and public betting points to TCU. So what is one to do? It’s hard to resist betting these bowl games but you can go through a lot of money betting these with no edge to speak of. Usually on steam moves like this by the time you see them it’s too late to take the side with the steam. Not always of course but as a general rule that is the situation. My rule is to take the other side of the steam on a big move or pass. I am passing as I do not bet games where 64% of the betting is on that side.